AHHH!! Finally, I can share these exciting news with ALL OF YOU! I'm actually tearing up as a write this for multiple reasons. Losing a baby at the beginning of the year was a big low for me- for us. I feel very lucky and very thankful as I know how difficult it is for some women to be able to conceive. Now I fully understand the term "rainbow baby"- that magical ray of sunshine that comes after the storm. It is no secret that we were trying; after the miscarriage, my hormones levels took a while to go back to normal. 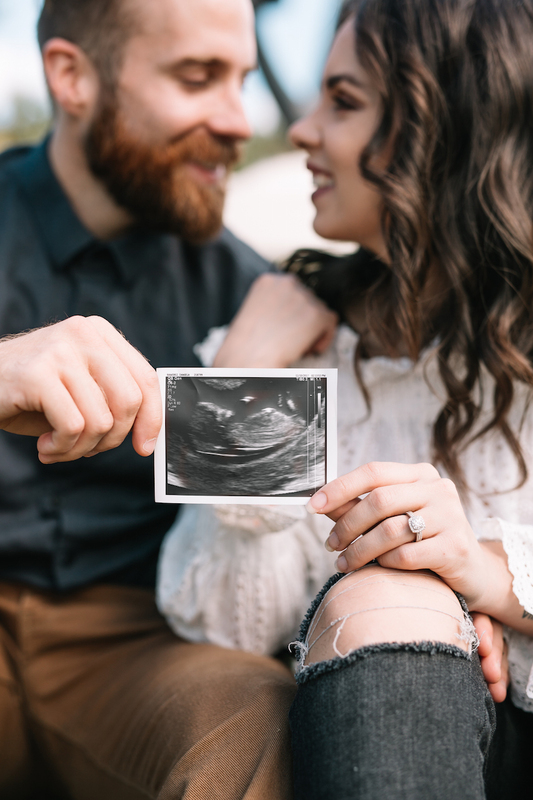 After everything seemed back to pre-pregnancy, I had all my ob-gyn exams- and we got the green light to start trying again. I found out I was pregnant in September - OMG that feels like so long ago. I cannot believe I have been keeping this secret for so many months. But of course, I wanted to make sure everything was alright. 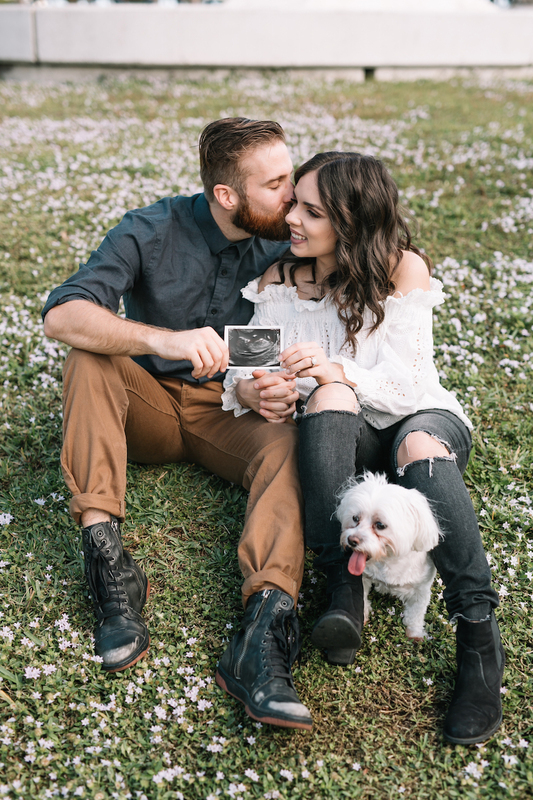 We didn't tell our parents until the first ultrasound at 8 weeks (where we saw the heartbeat, the most exciting day!!) Last time I was alone (Gabe had just broken his leg), and this time, we were together- holding hands and looking at each other proudly . It was exactly what I have always dreamed of. I'm not going to lie, I'm still very scared. My heart beats off my chest at every doctor's appointment. But I'm so hopeful and excited for 2018. I also want to take a sec to thank you for the love and support we got after I share my miscarriage story . It makes me even more excited to share these news with you. A lot of you have been part of my life since I was 21 and about to graduate, you saw me get my first job, quit my first job, go back to school, get engaged, get married- and now I'm very happy that I get to share this new chapter in my life. I want to do a Q&A video or maybe a LIVE answering all your questions. Let's see. But I just couldn't wait any longer! Just in case you are wondering I'm 18 weeks! ¡¡AHHH!! ¡¡No tienen idea cuanto tiempo llevo queriendo poder compartir estas noticias con ustedes! ¡VAMOS A TENER UN BEBE! He llorado mucho escribiendo este post por muchas razones (aparte de ser una llorona que aparte tiene las hormonas alborotadas). Perder un bebé a principios de este año fue definitivamente uno de los momentos más difíciles de mi vida. Razón por la cual me siento muy agradecida de tener esta segunda oportunidad- se lo difícil que es para muchas mujeres poder salir embarazadas y sé lo afortunada que soy. Ya obviamente no es ningún secreto que queríamos tener un bebé. Después de la pérdida tuvimos que esperar varias veces a que todo volviese a la normalidad. Cuando por fin bajaron mis hormonas, me hice todos mi exámenes para asegurarme que todo estuviese bien. Me enteré que estaba embarazada en septiembre- WOW no puedo creer que ha pasado tanto tiempo. No compartir este secreto con ustedes fue complicado, y también nos aguantamos bastante para contarles a nuestros familiares y amigos. Pero como se imaginan queríamos asegurarnos que todo estuviese bien. Se acuerda que la vez pasada les conté que fui sola a las primeras citas ya que Gabe se acababa e romper la pierna. Esta vez fue exactamente como lo soñé siempre, juntos, agarrados de mano mirándonos orgullosamente por esa nueva vida. No les miento, tengo muchos miedos y temores. Cada vez que tengo cita, el corazón se me va a salir del pecho. Pero estoy muy emocionada y llena de ilusiones para este 2018. También quería tomar otro segundo para agradecerles por todo el cariño. Sé que muchas me escribirán "lo sabía!!" pero no dijeron nada por respeto a todo lo que pasó anteriormente y eso para mí significa un mundo. Gracias a todas las que me han acompañado en cada momento importante; graduaciones, mi boda- y ahora en este nuevo capítulo. Quiero hacer un video de preguntas y respuestas. Tal vez un LIVE respondiéndoles lo que quieran saber. Pude haber planeado esto mejor pero es que quería compartirlo YA! 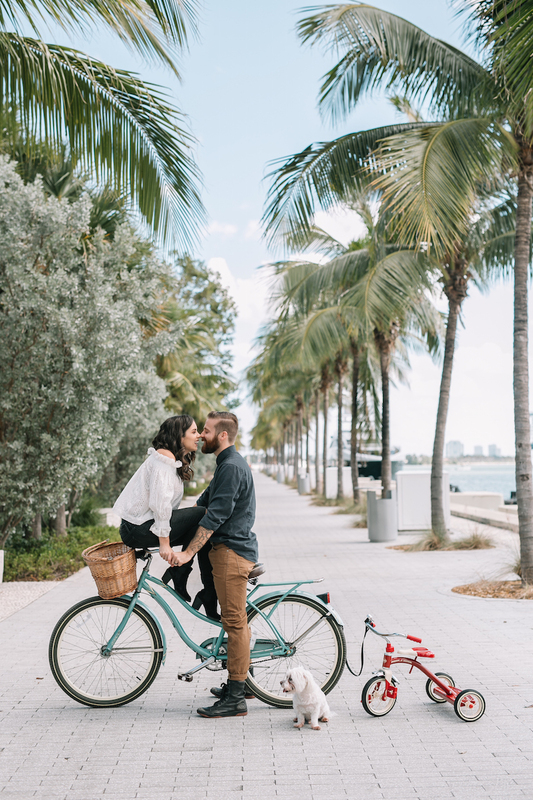 For the pictures, we wanted to recreate our engagement photo...but to add another bike for the baby! and of course, we wanted to add our furry first baby to it! I don't know why he wasn't in the original one but he is claiming his spot here too haha. The photos were taken by our wedding photographer: Darling Juliet. She is absolutely amazing- and we love that she got to capture this moment with us. Aunque no nos conozcamos personalmente, tu me has inspirado muchísimo y pensar como no tienes idea en mi proyecto, futuro y demás. Les deseo lo mejor de la vida en esta nueva etapa como padres, que el bebé nazca hermoso (como se que será jeje) y sano (que es lo más importante). Que las bendiciones no dejen de caer sobre ustedes, su hermosa familia y proyectos. Omgg felicidades!! No puedo esperar los looks de tu mini fashionista boy o girl!! Muchas bendiciones y cariños!! Mil felicidades!! Me alegro muchísimo por ustedes! Un baby es el mejor regalo!! Congratulations!! Aww~ I'm so happy for you! Wish you all the best! FELIZ POR USTEDES, SE MERECEN TODA LA FELICIDAD DEL MUNDO ENTERO! Será una hermosa niña! trata de estar relajada pues tu bebita lo percibe. Todo estará bien, muchas felicidades!! So much love for you both. Could not be happier for you two.